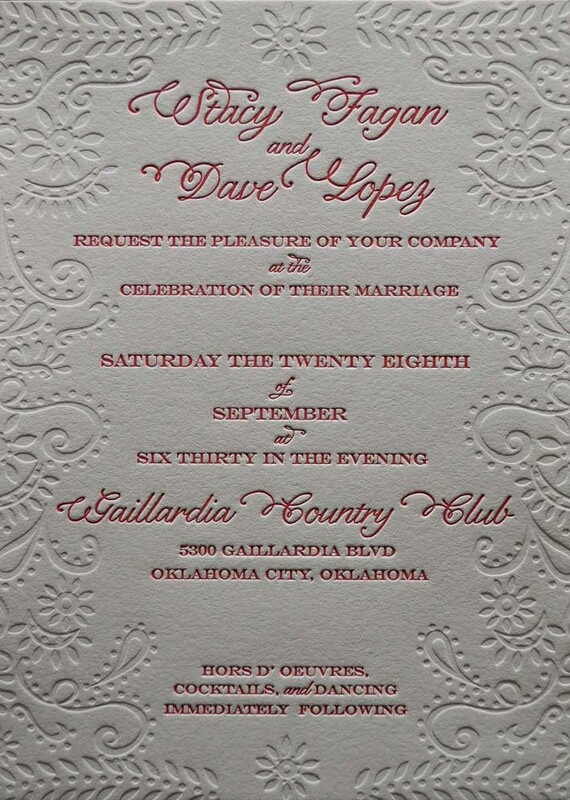 Letterpress Printing | AccuColor Plus, Inc.
We have six auto paper feed letterpress printing presses. 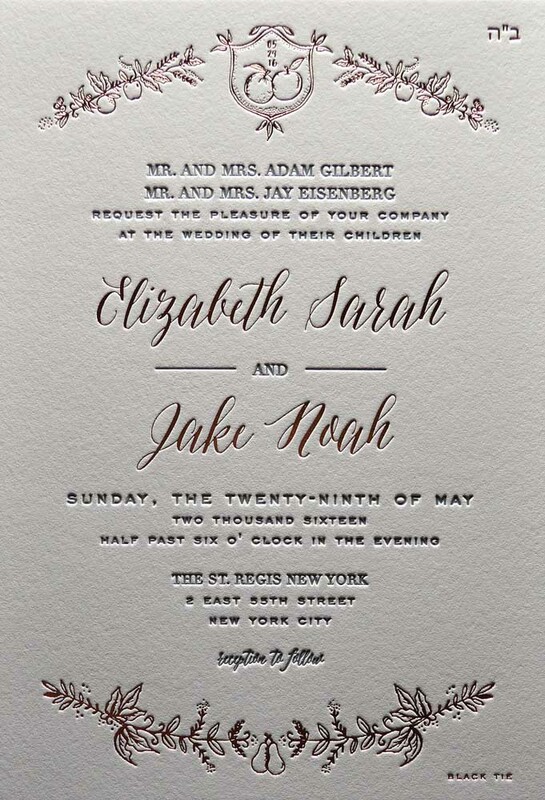 This is the oldest form of printing, invented by Johannes Guttenberg in the mid 1400's, and made popular again, due to the distinctive printed impression. 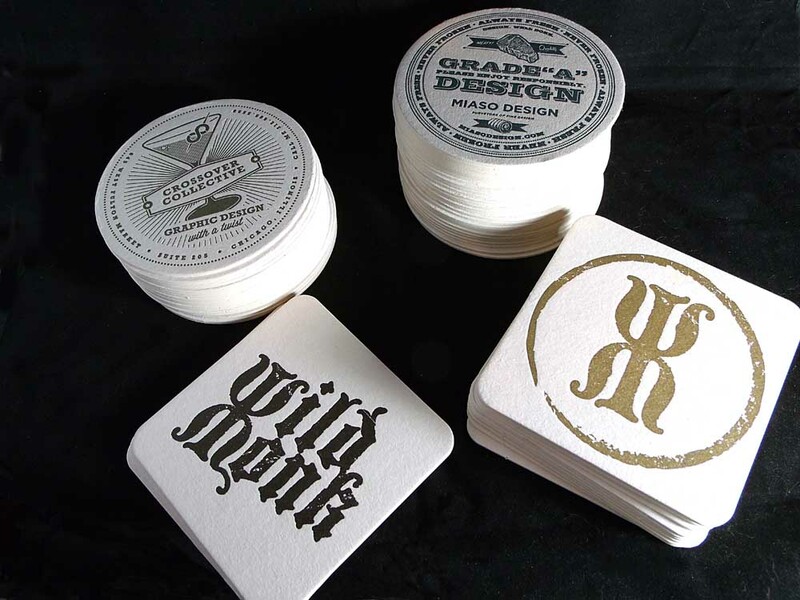 Letterpress printing plates are manufactured in our studio. 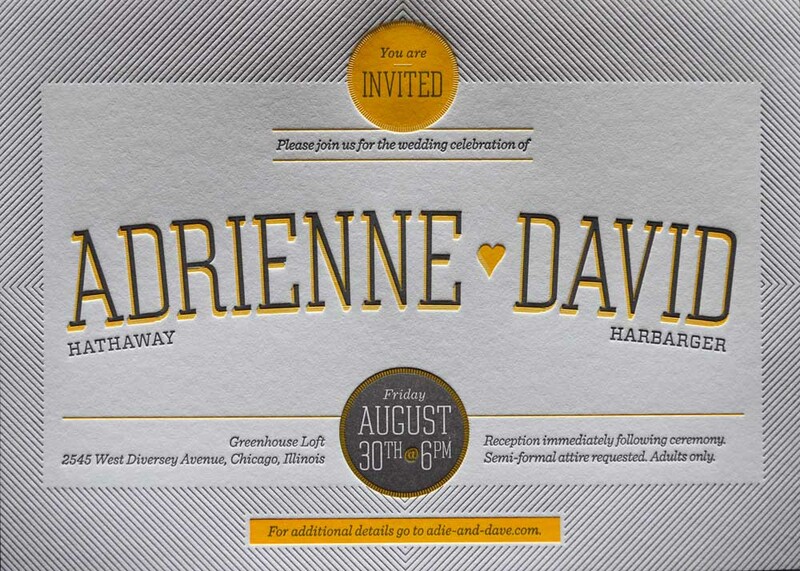 Plates are imaged from your provided Adobe Illustrator, Adobe InDesign or Quark Xpress files. 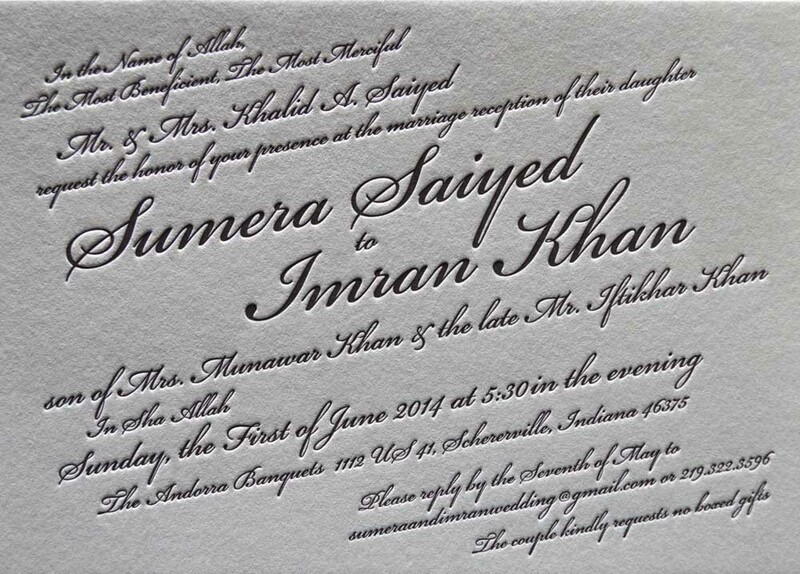 We do not do any graphic design or layout work, and print exclusively from design files which are provided to us. 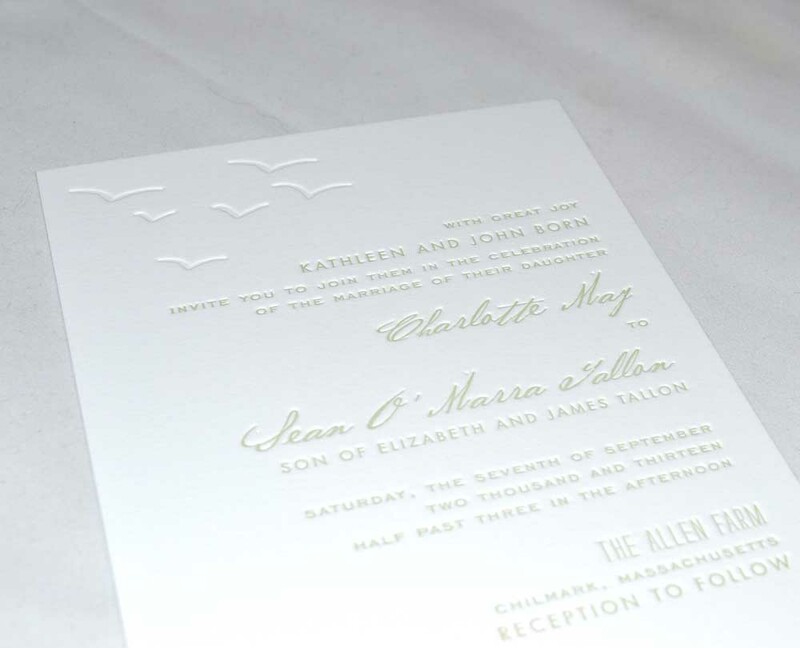 In order to hold on the plate, all type and line work must be a minimum of 1/4 point thick. 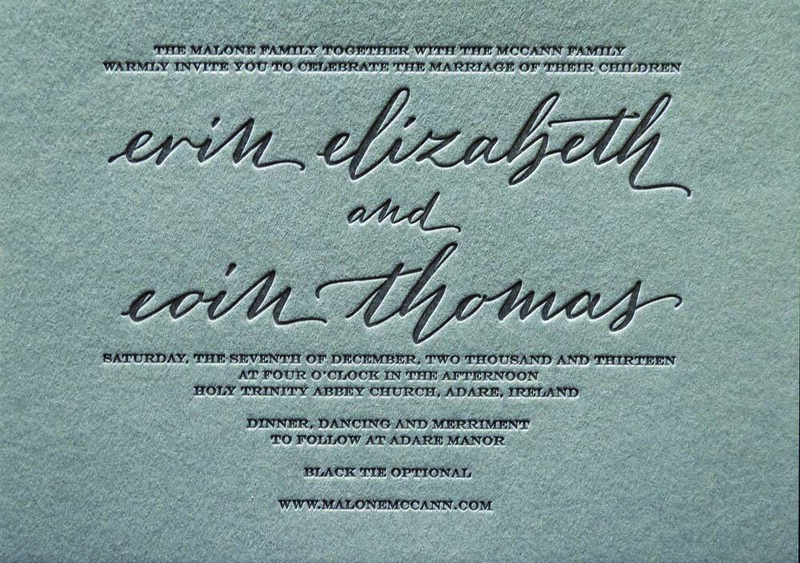 This is of particular importance with many of the script fonts, as often there are very thin swirls at the letter end. 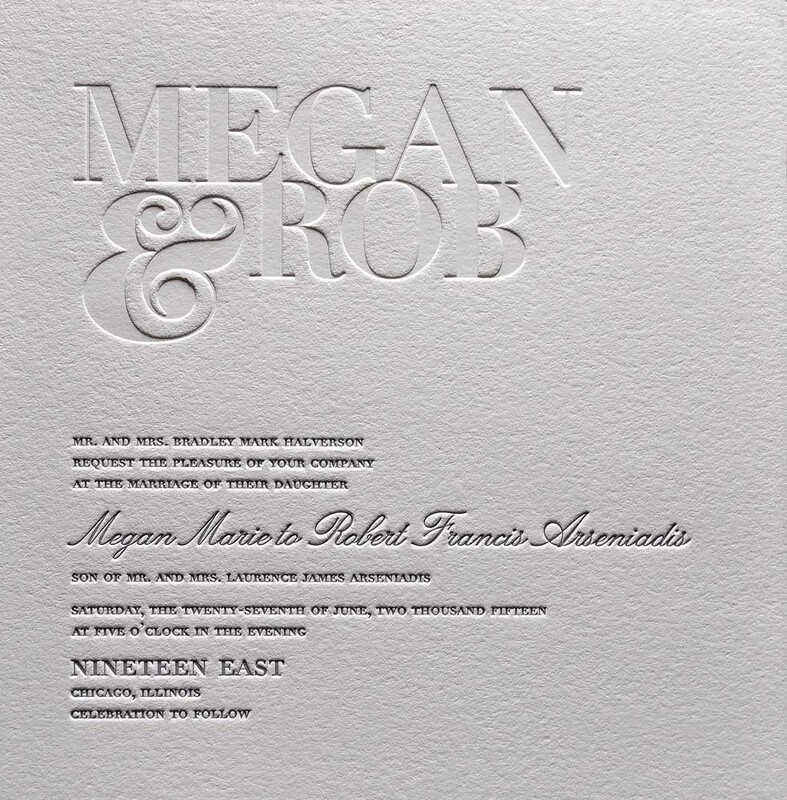 Many times script fonts require a stroke to become thick enough to hold on the letterpress plate. 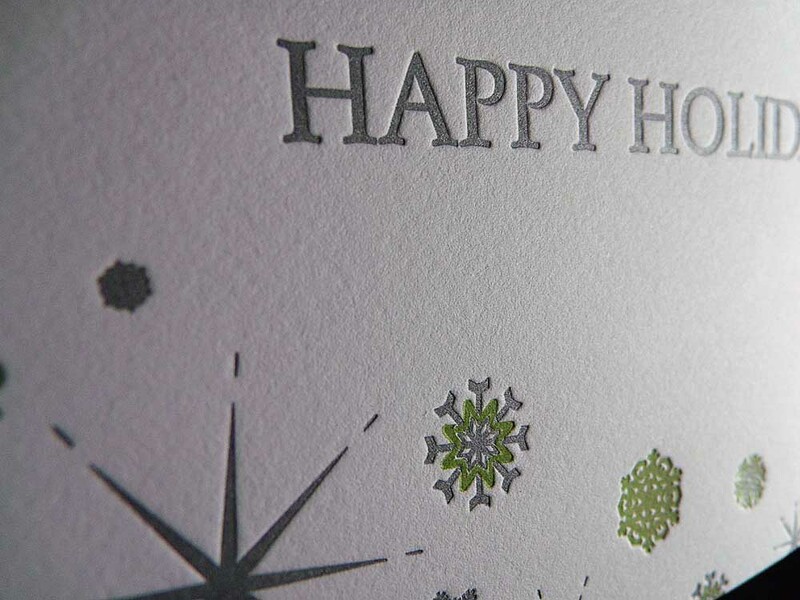 Available ink colors are those of the Pantone Solid Uncoated Swatch Library, including metallics, pastels and neons. 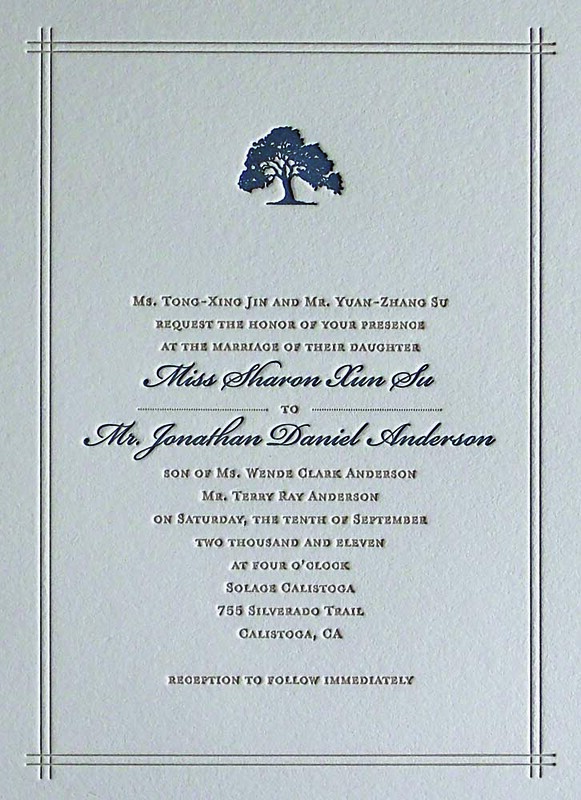 With the exception of the metallic inks, the selected ink color must be darker than the color of the paper. 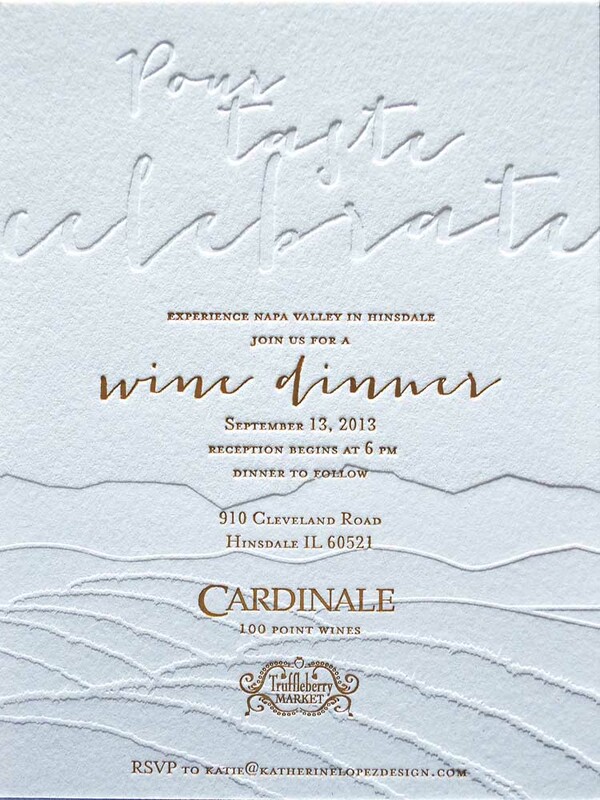 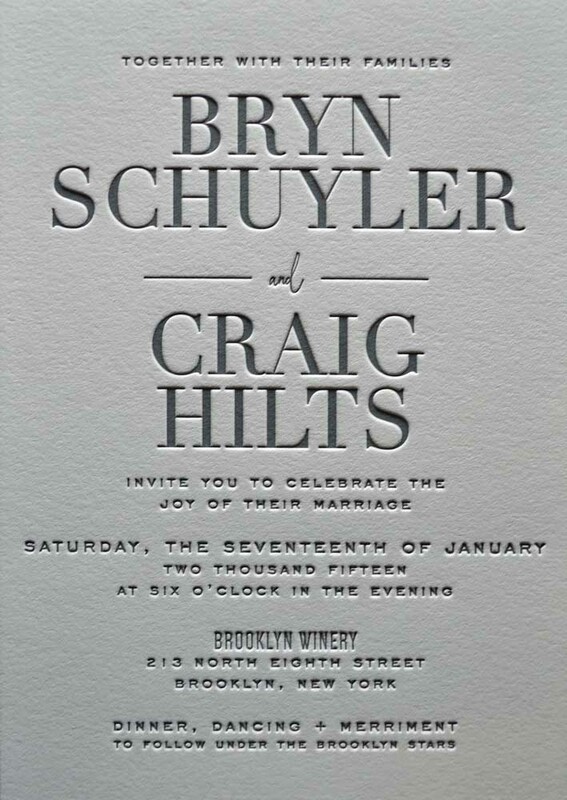 Letterpress papers must have a soft surface. 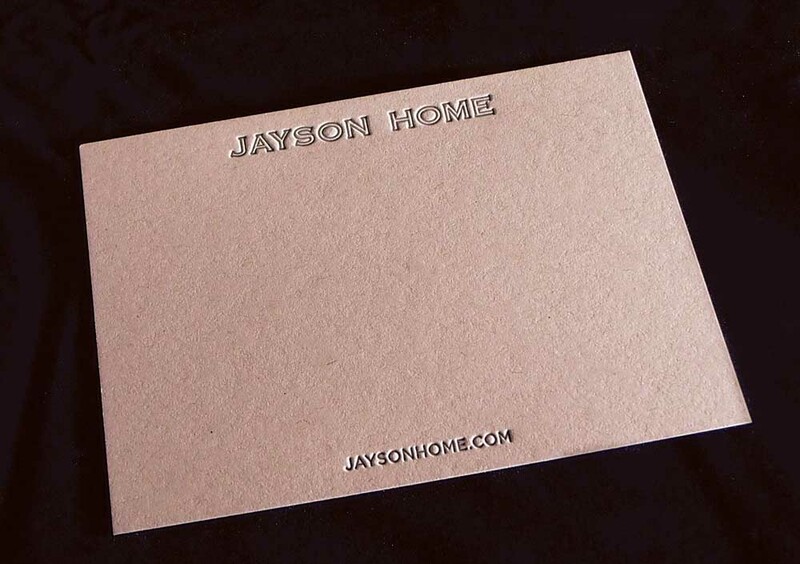 Papers made of 100% cotton perform the very best. 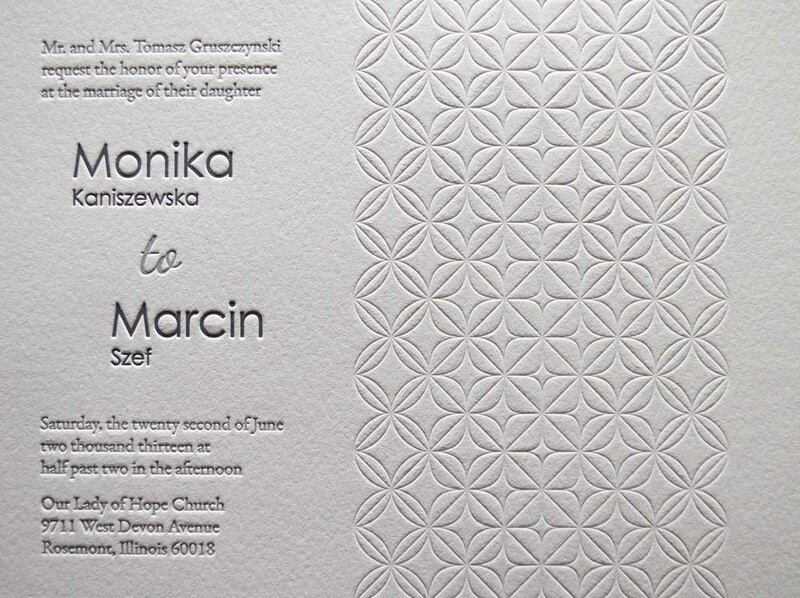 Other papers with a vellum or wove finish will also work well. 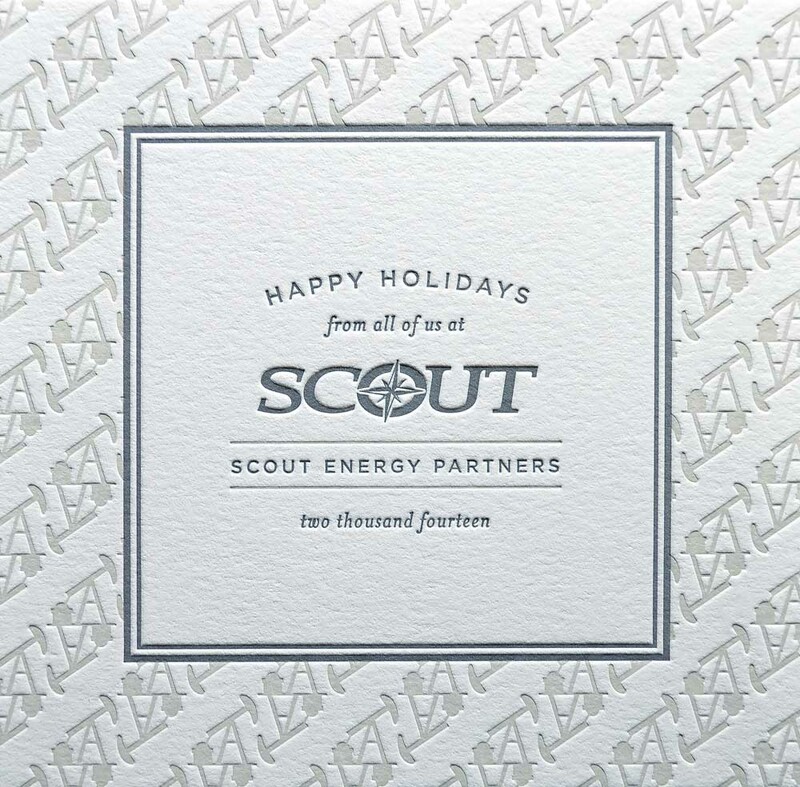 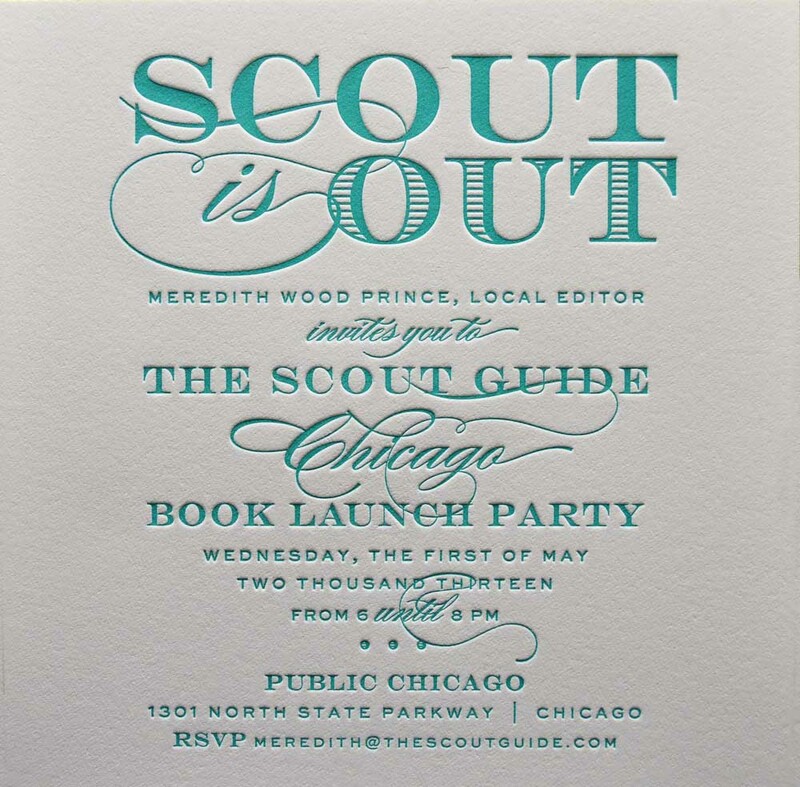 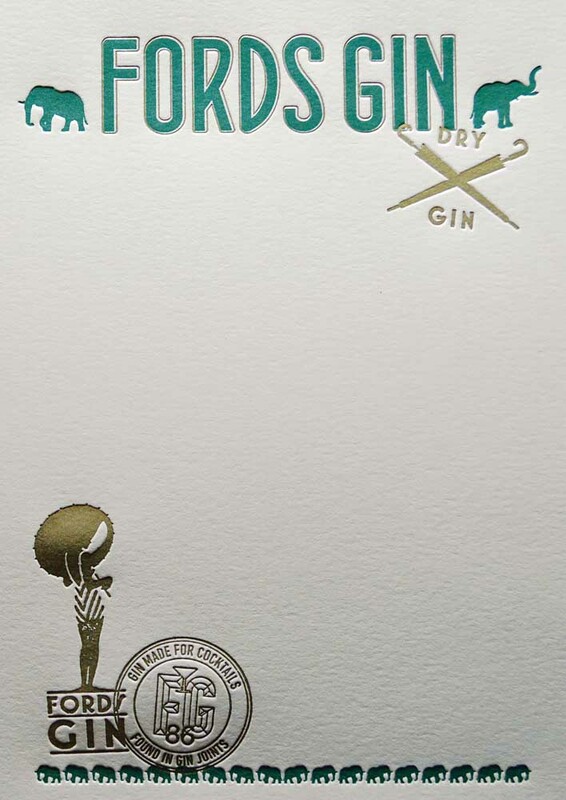 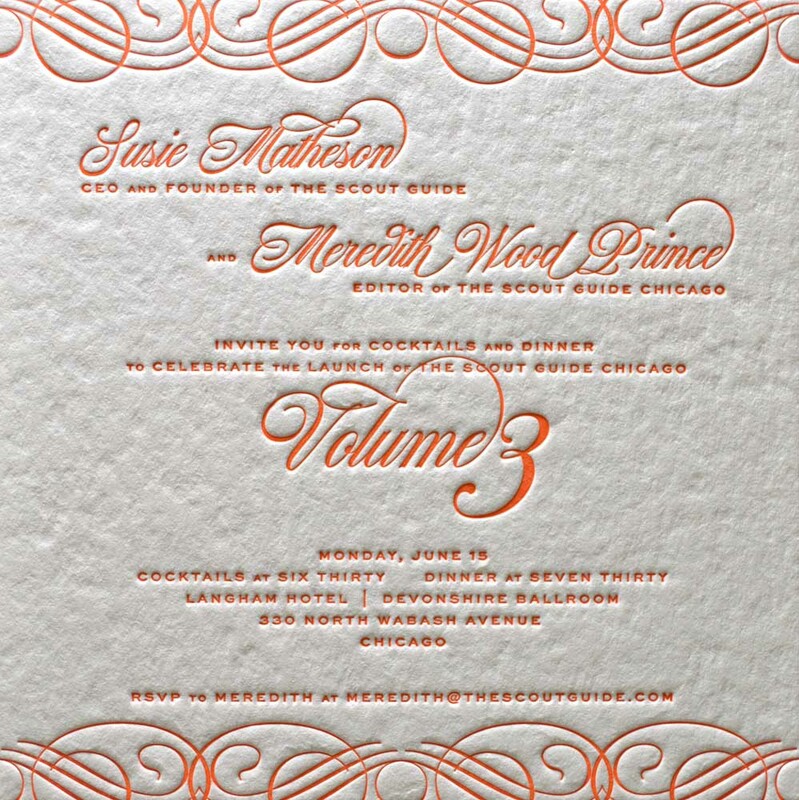 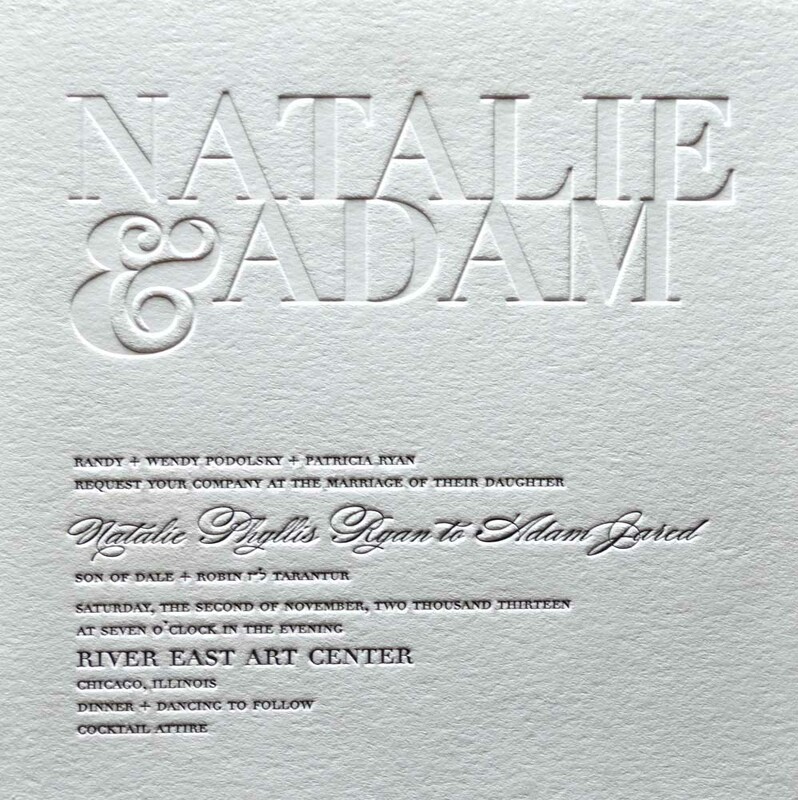 Smooth finished, metallic finished and coated papers are not acceptable for letterpress printing. 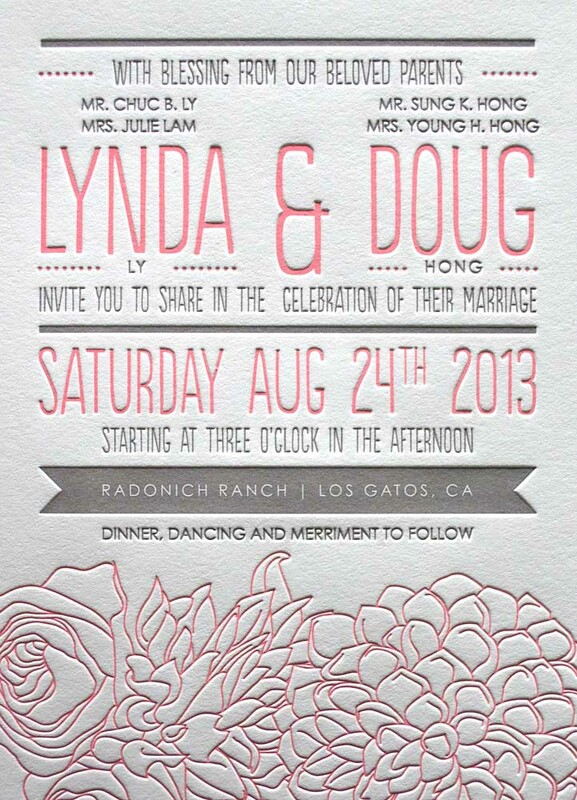 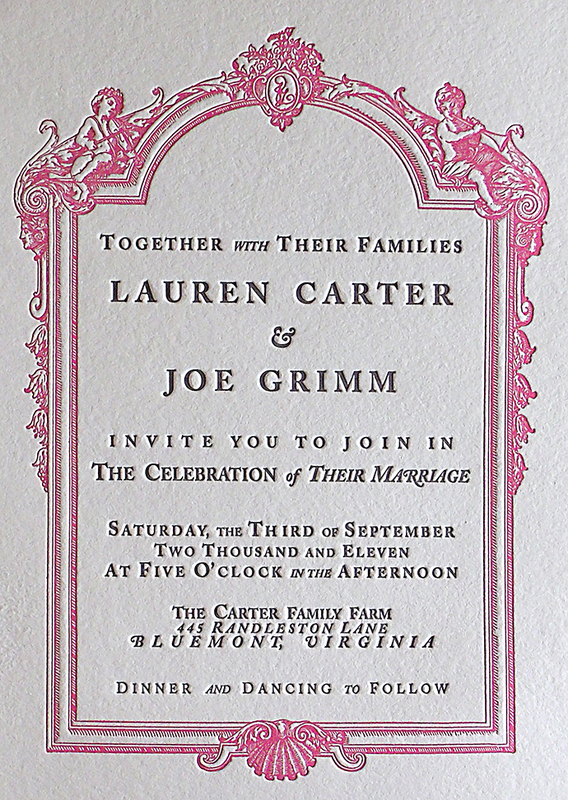 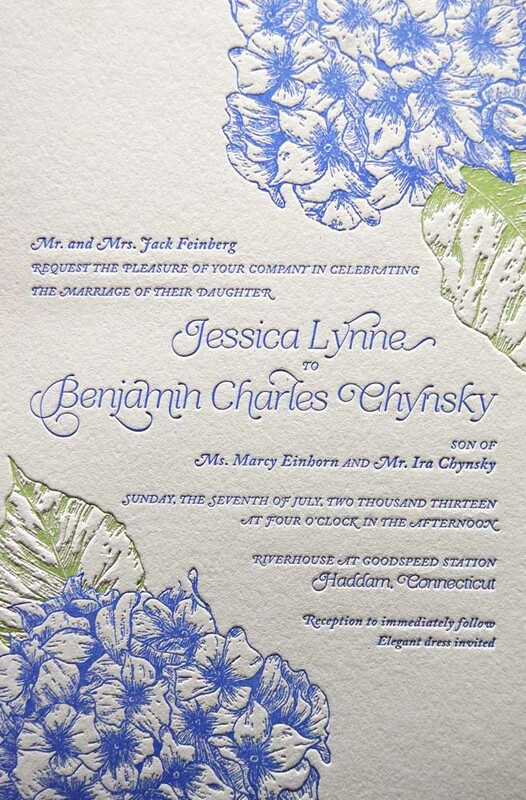 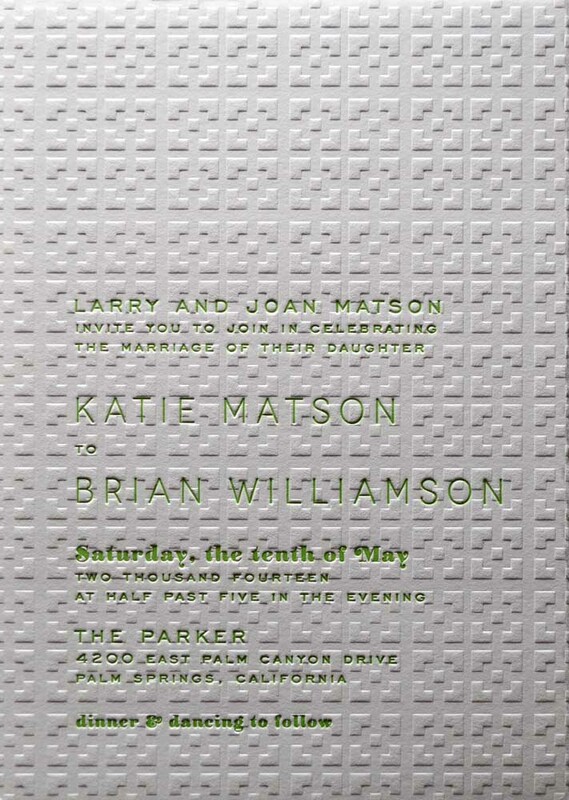 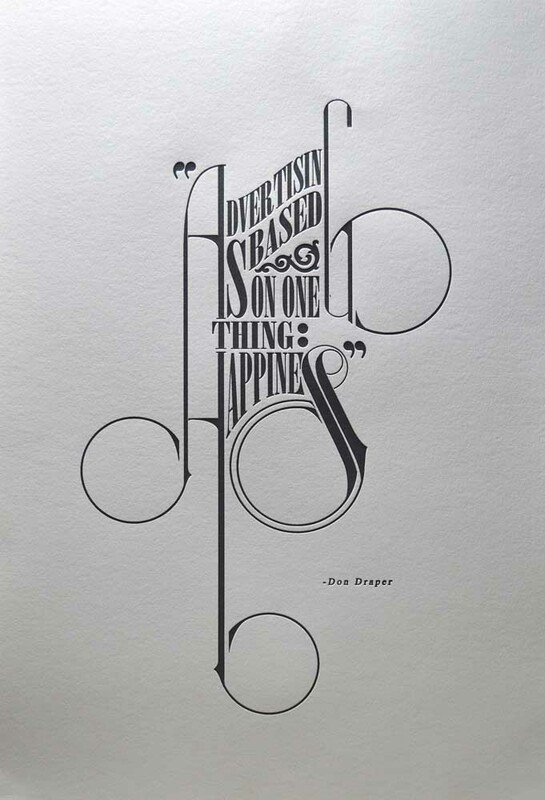 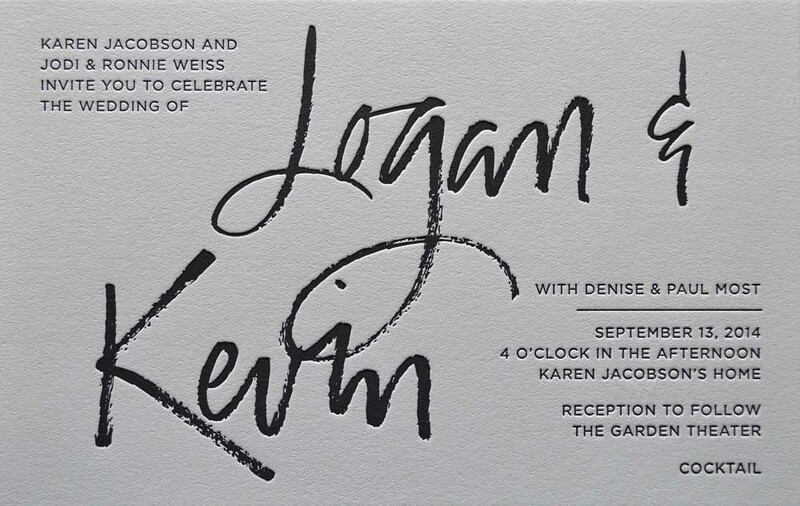 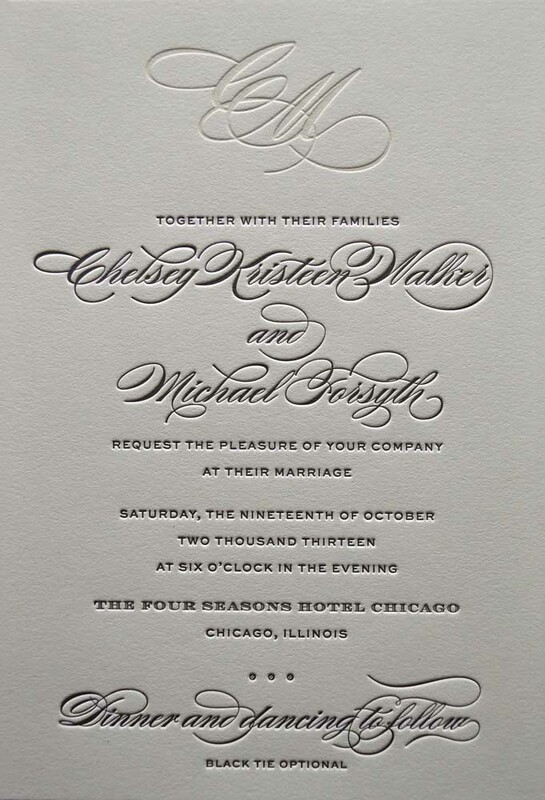 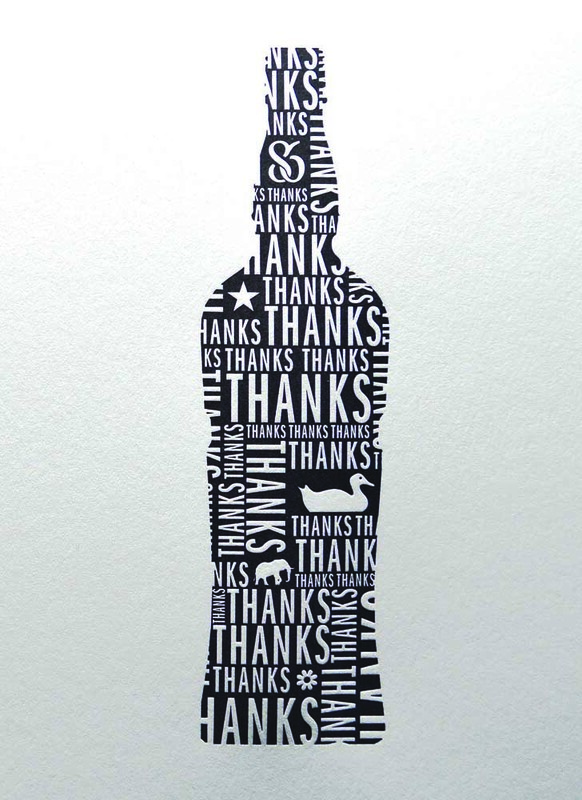 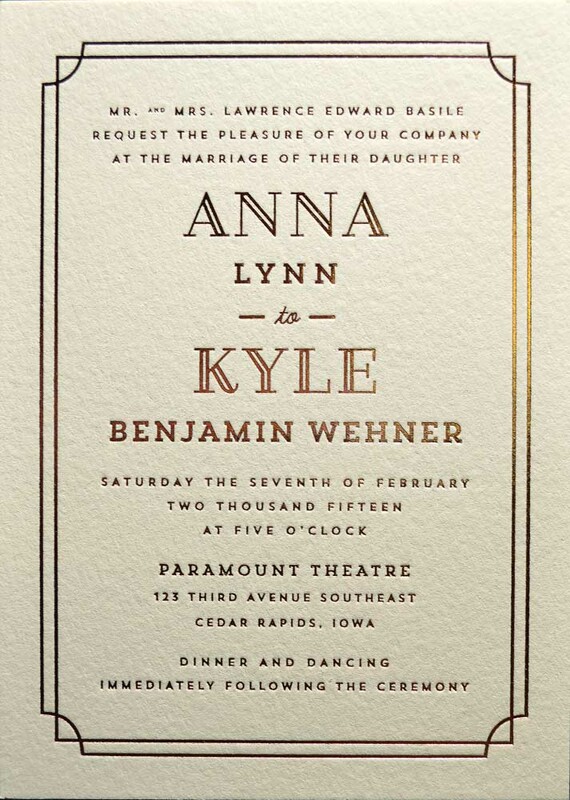 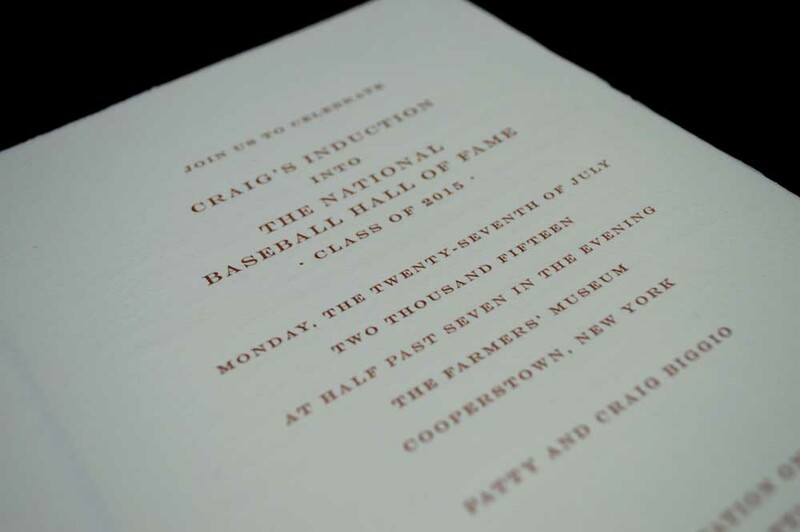 It is exceptionally important to design for letterpress printing much differently than for other printing processes. 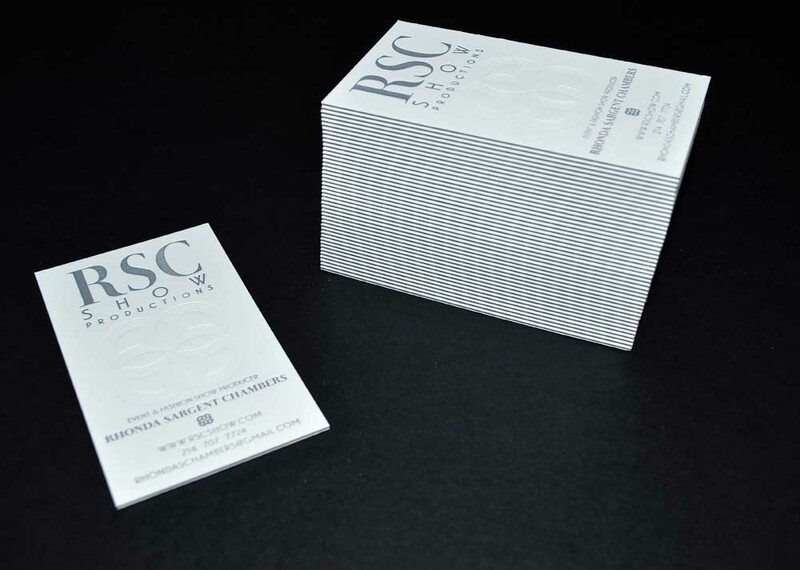 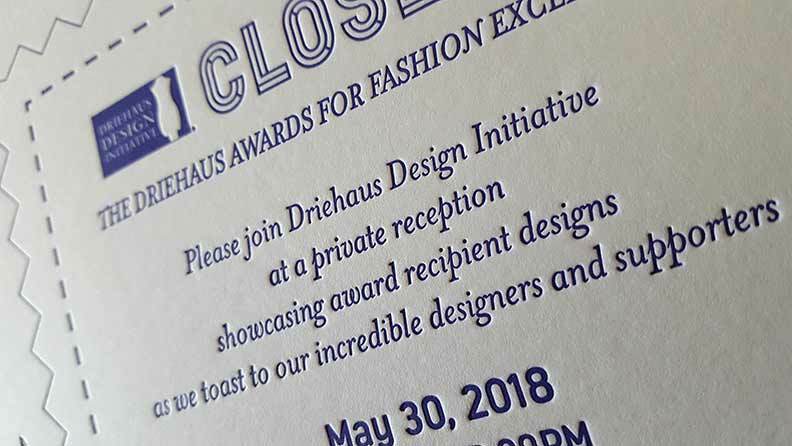 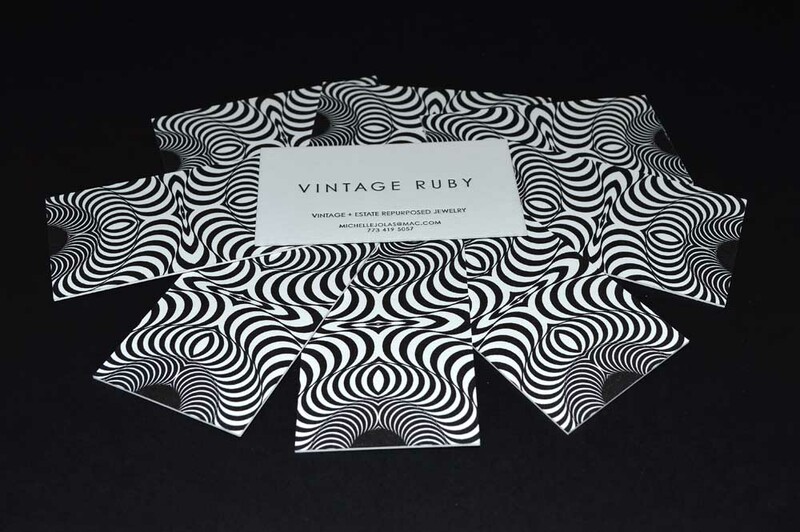 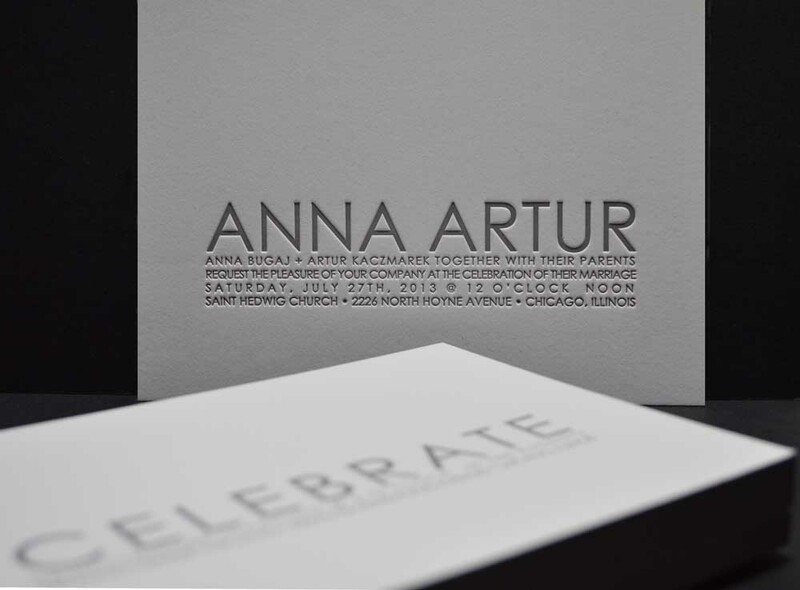 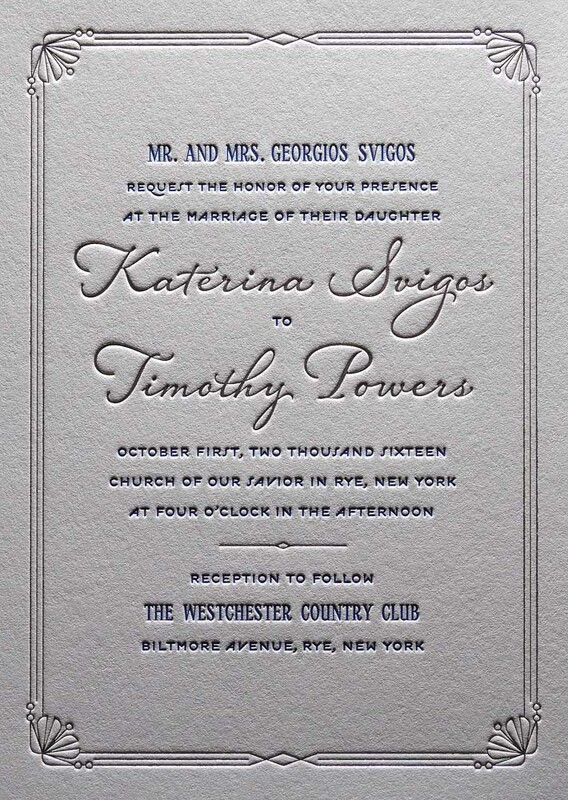 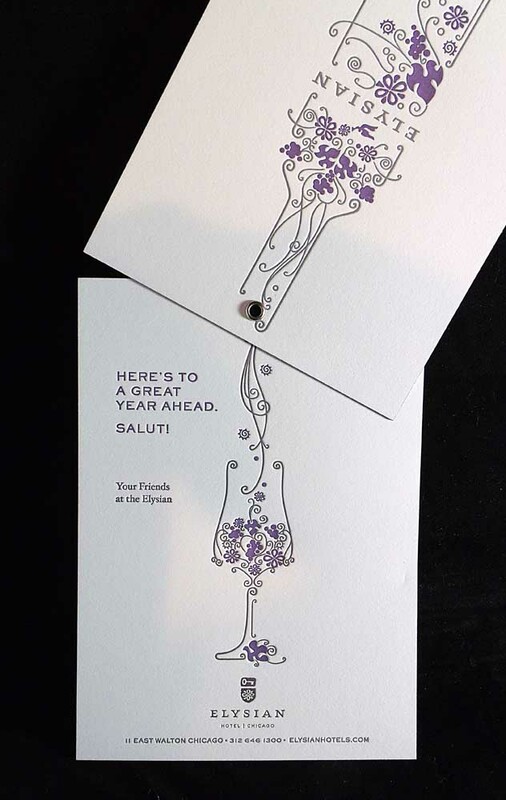 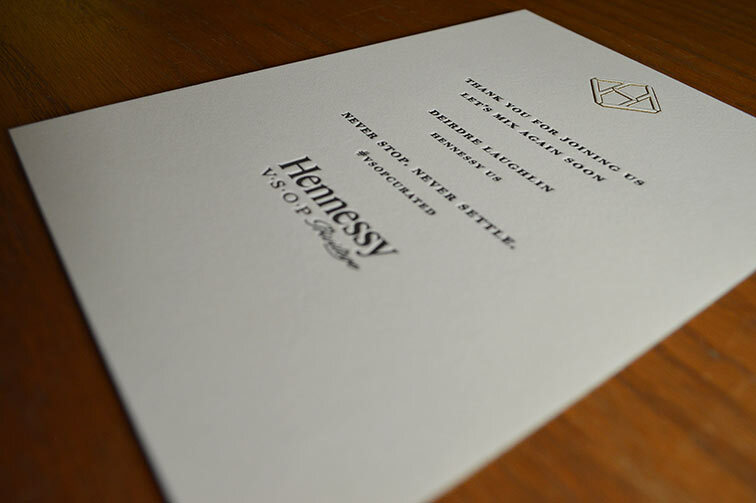 Letterpress printing performs best, and yields the most refined looking final printed piece, with the use of finer copy and the generous use of unprinted paper. 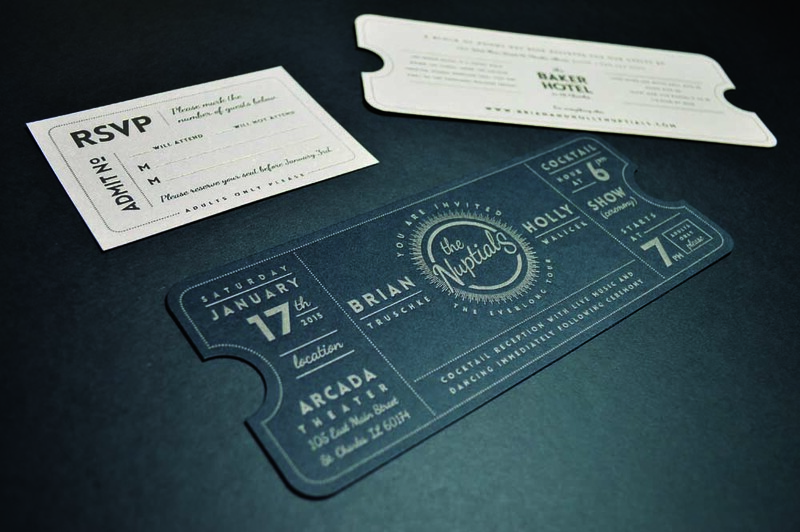 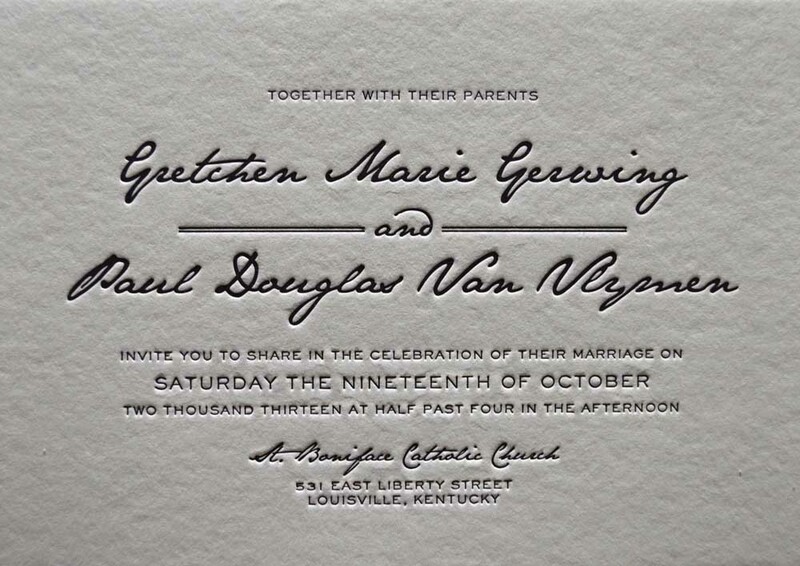 Letterpress printing equipment does not have the necessary inking system to produce large fields of ink consistently from sheet to sheet, and cannot provide appropriate inking for larger graphics and normal typography on the same press pass. 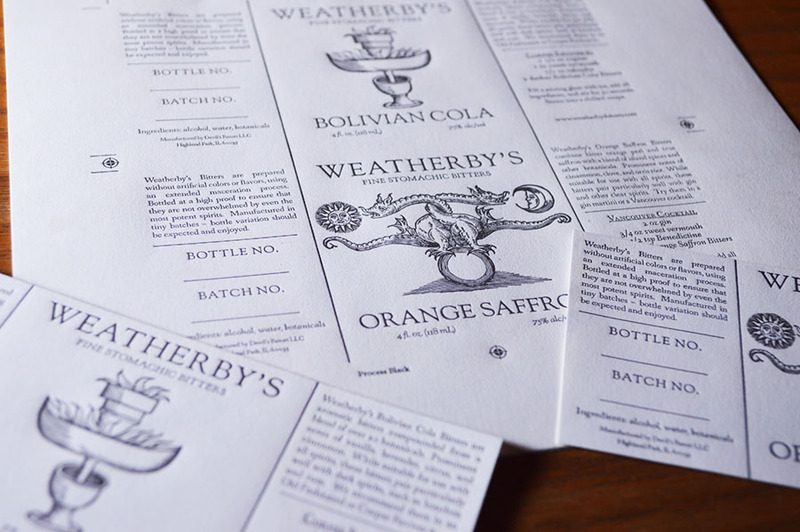 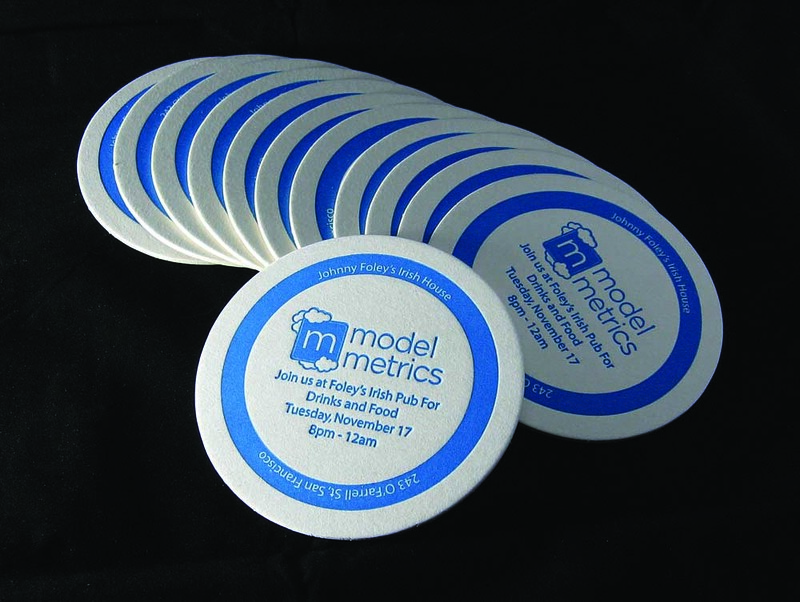 Any design with larger graphics must be submitted for review and approval before production. 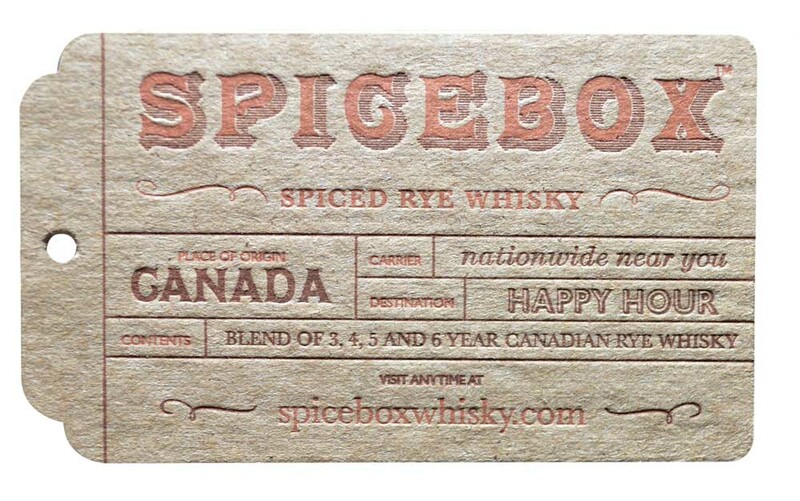 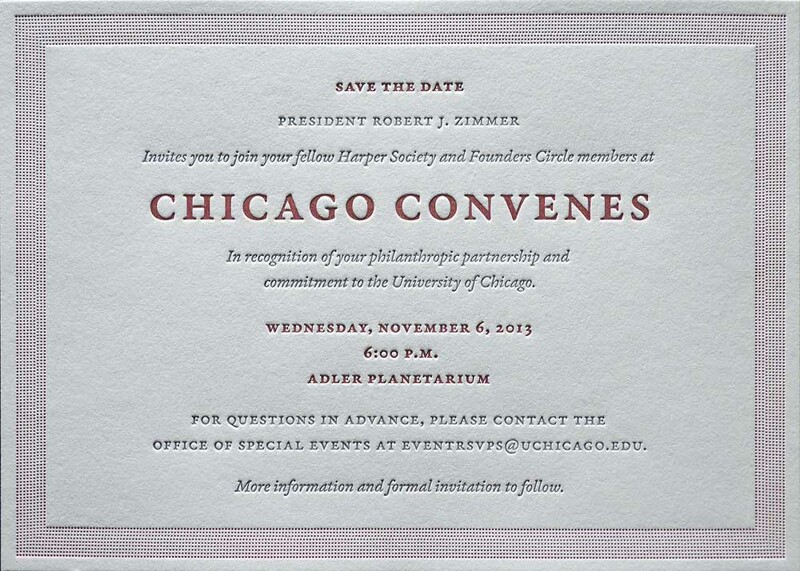 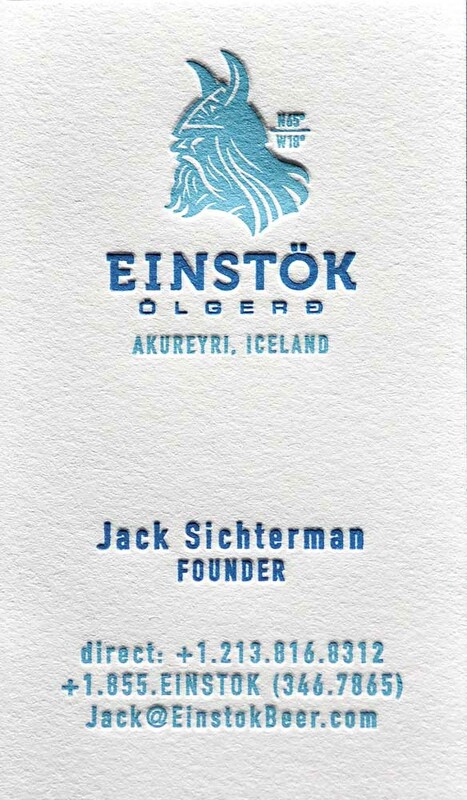 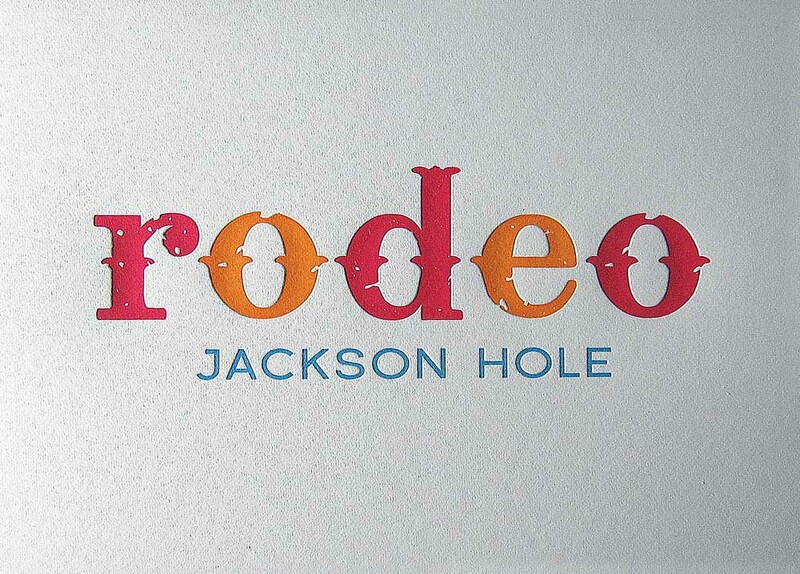 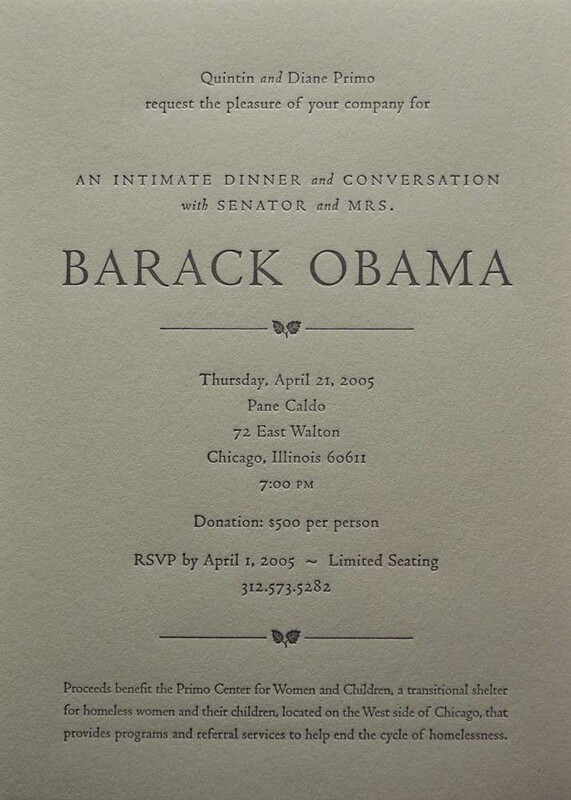 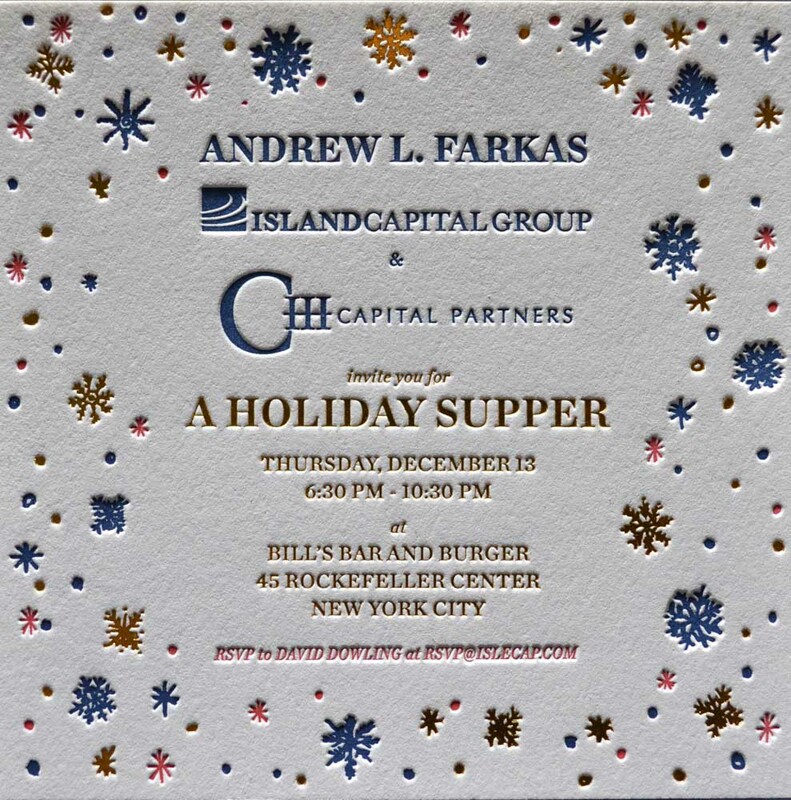 A design with a large field of inking with normal typography may require two press passes, making the project a two color piece, with two color pricing. 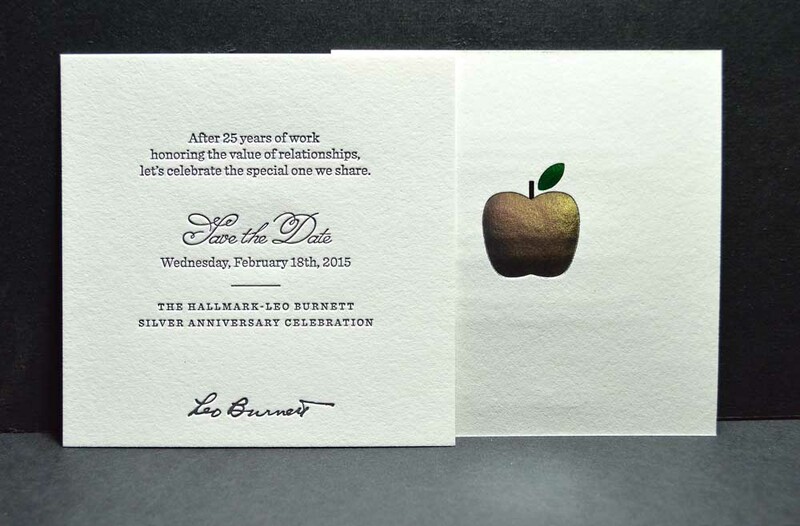 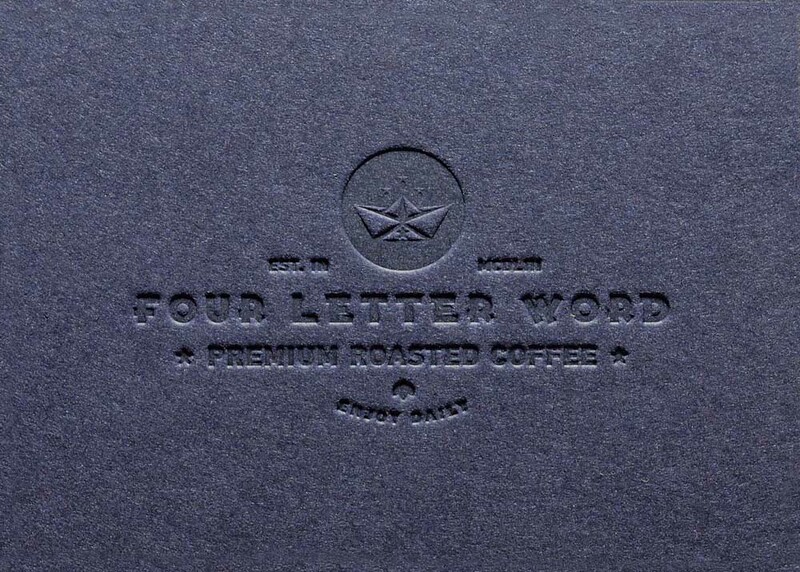 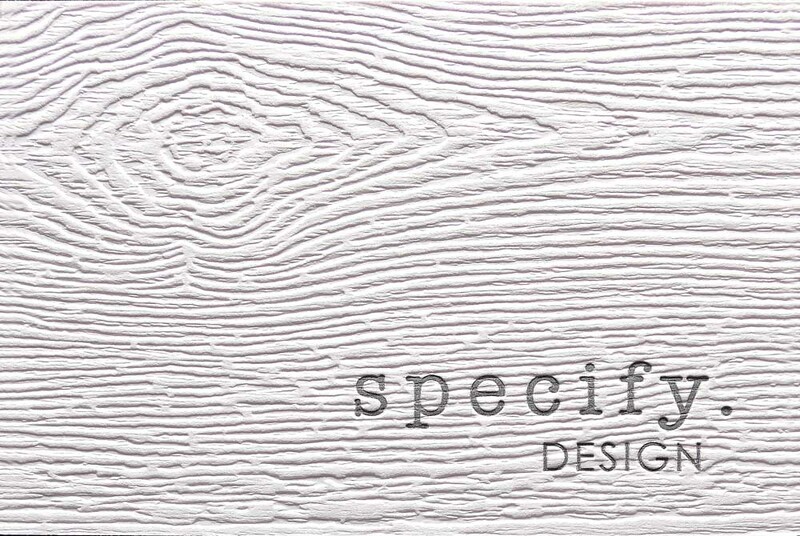 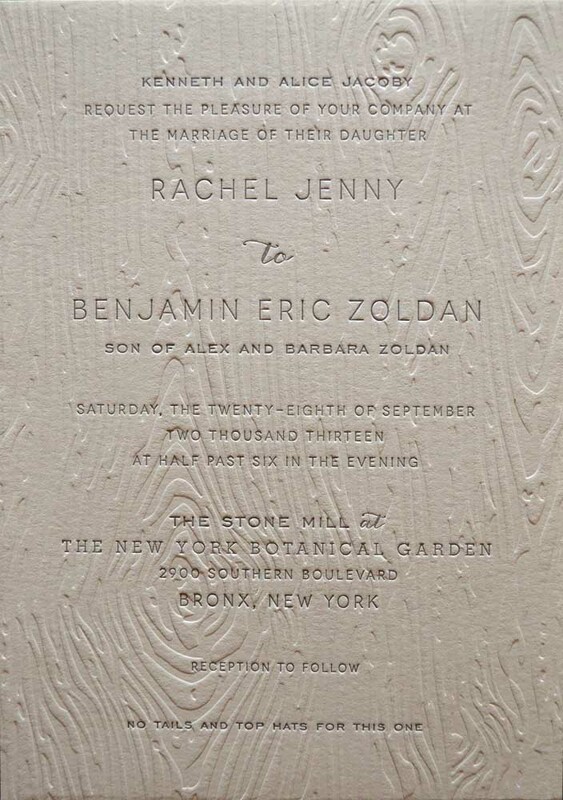 Only 100% values of color will letterpress print. 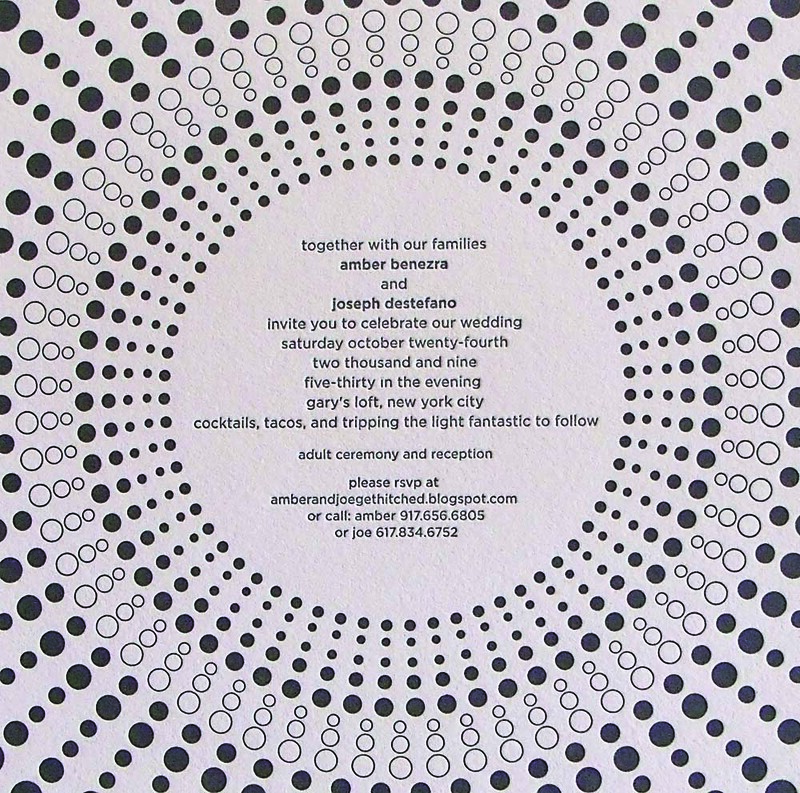 Letterpress printing does not support tints, percentages, opacities, vignettes, gradients, or halftone images. 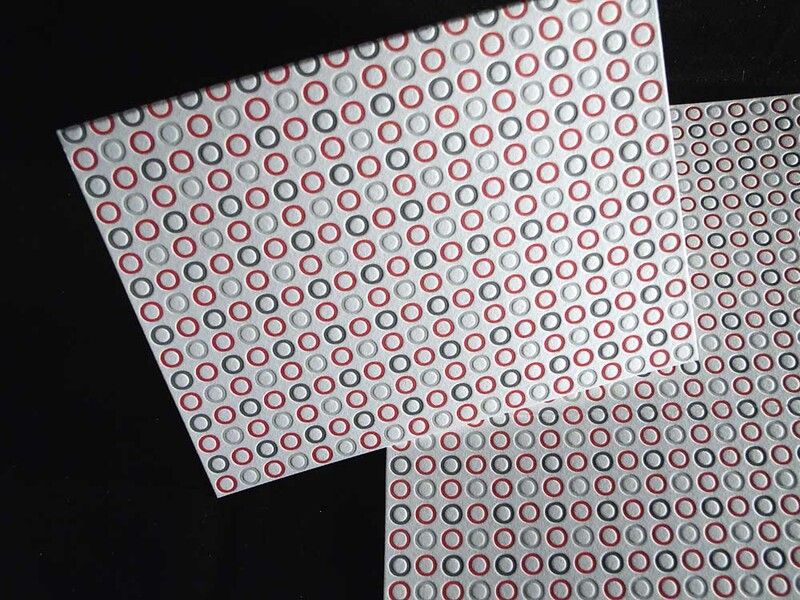 Line, rule and type thickness cannot be thinner than 1/4 point. 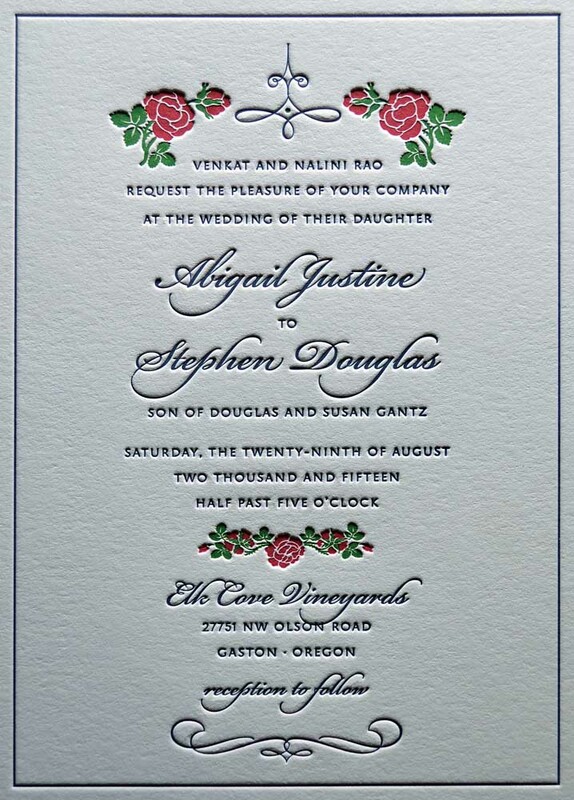 This is of particular concern for some of the script fonts. 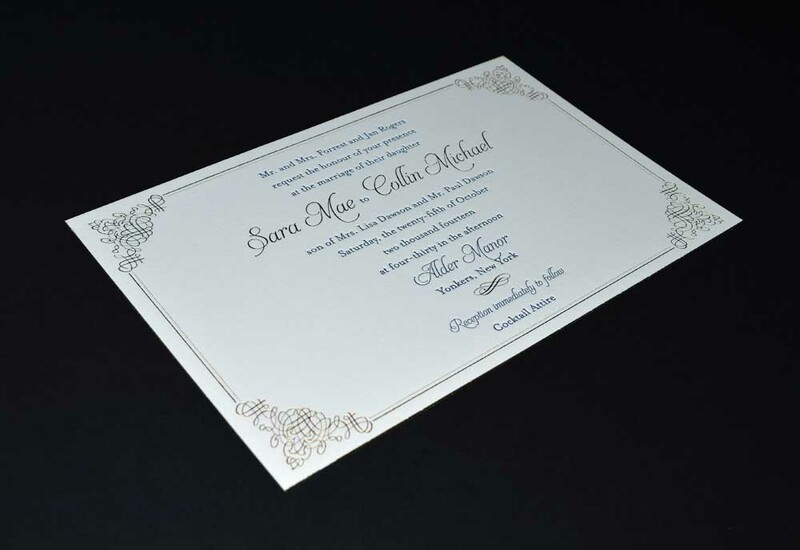 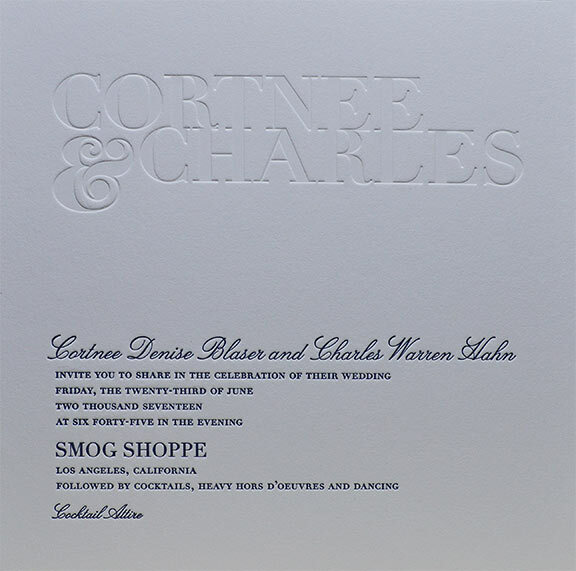 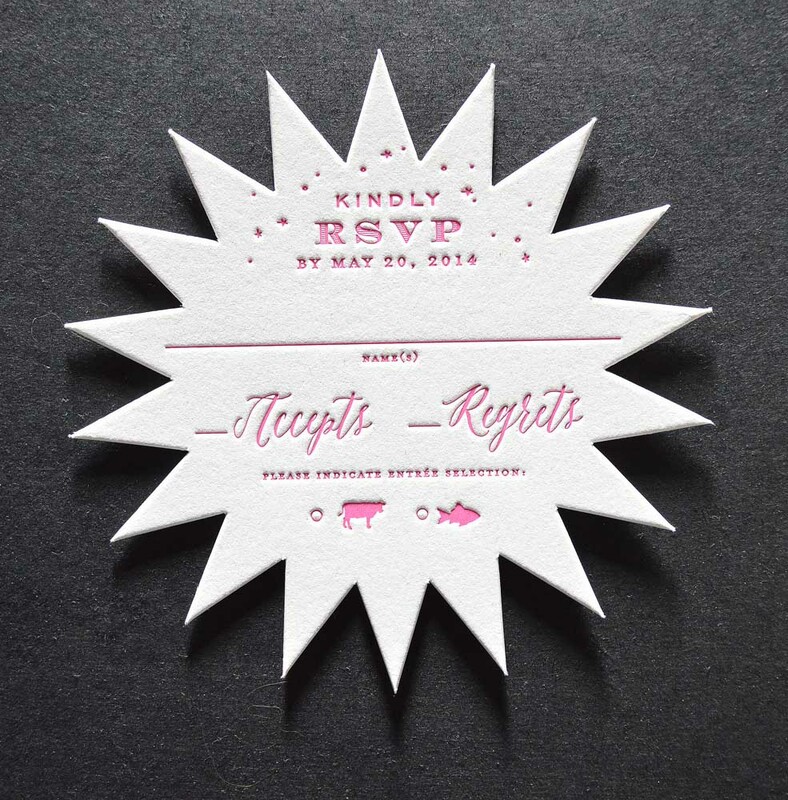 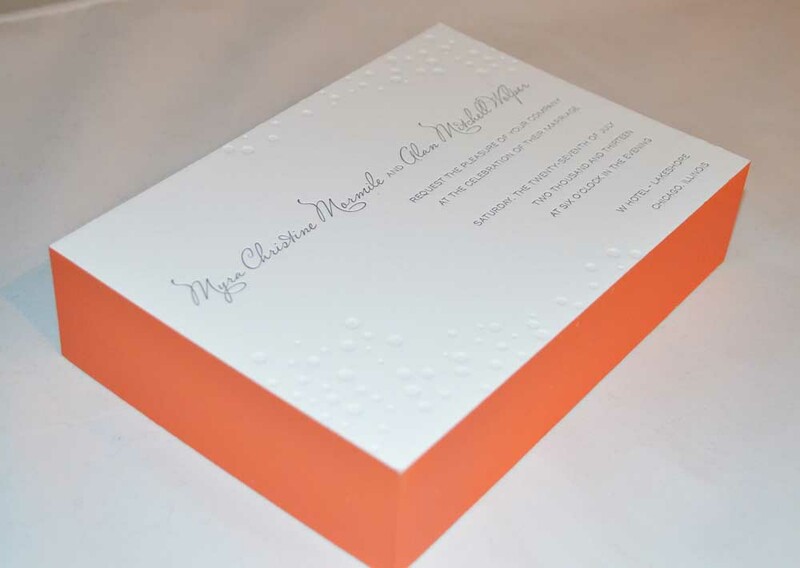 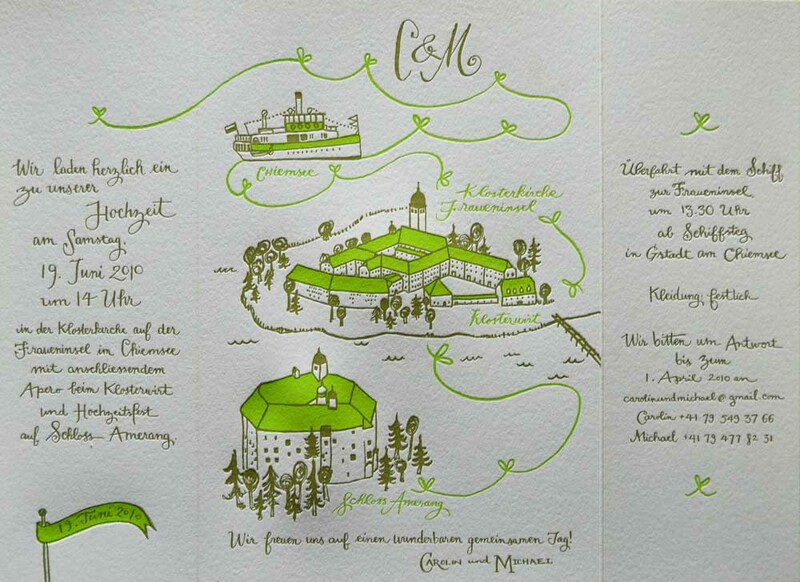 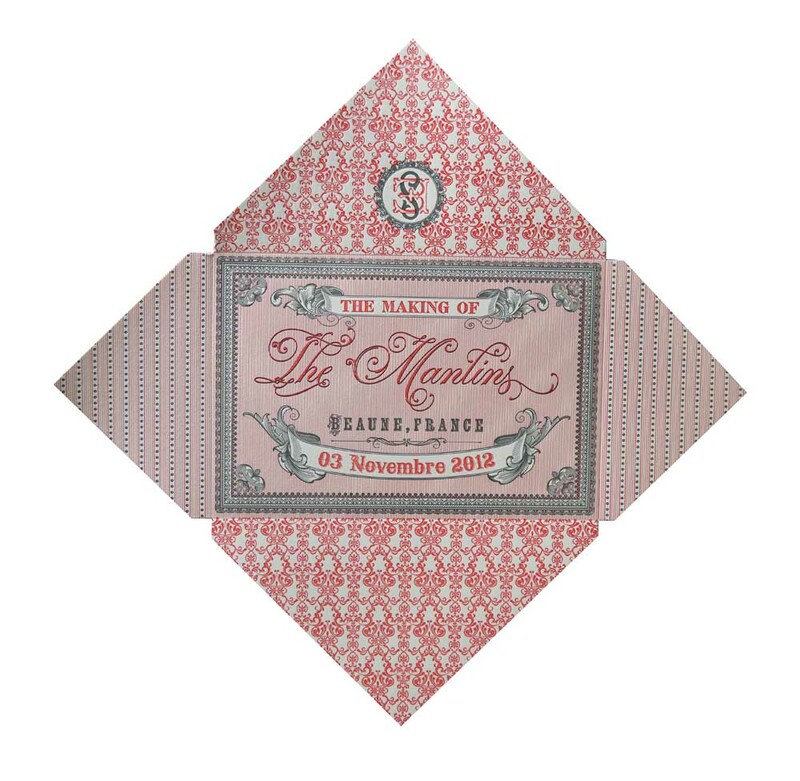 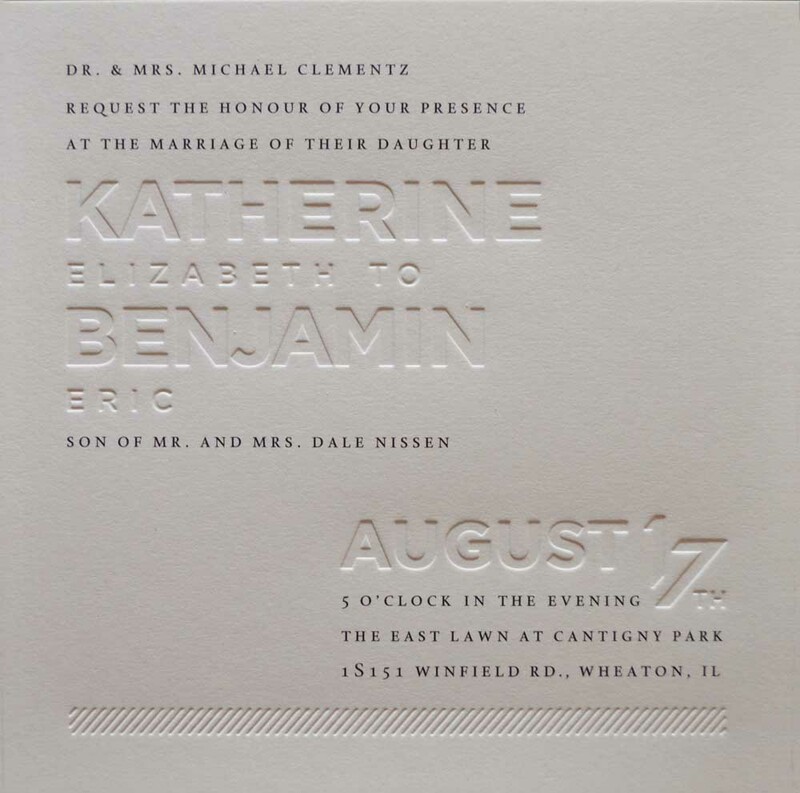 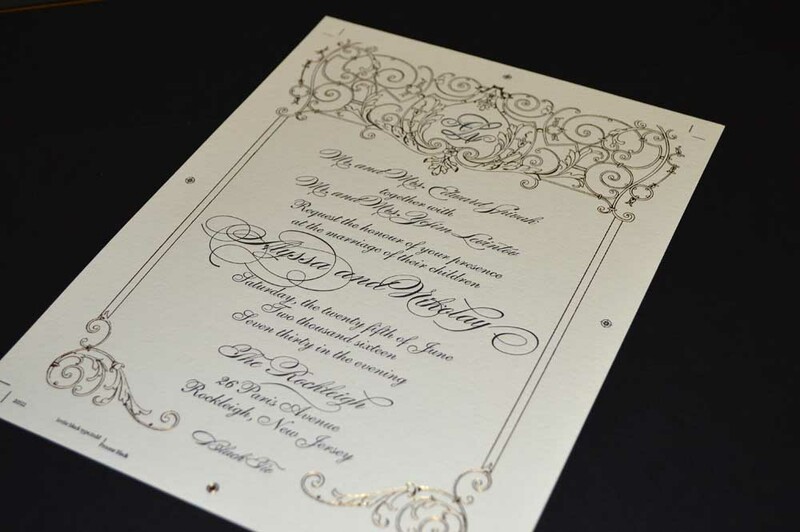 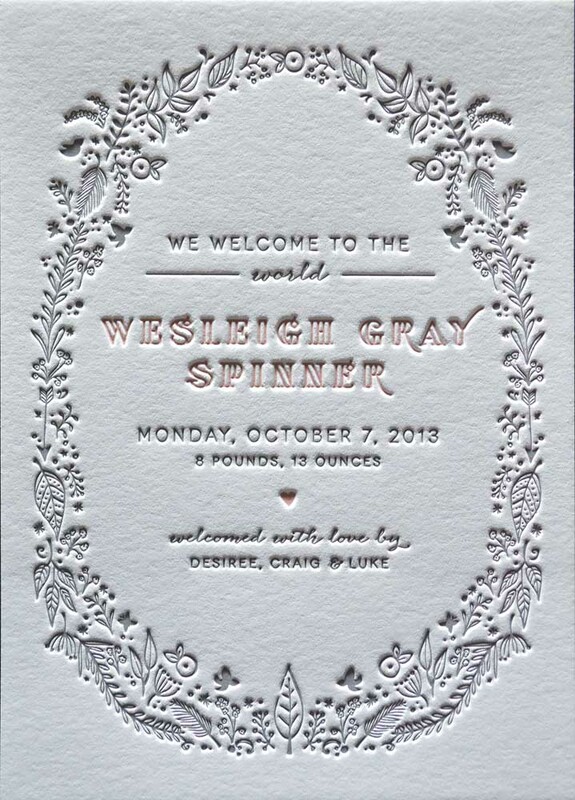 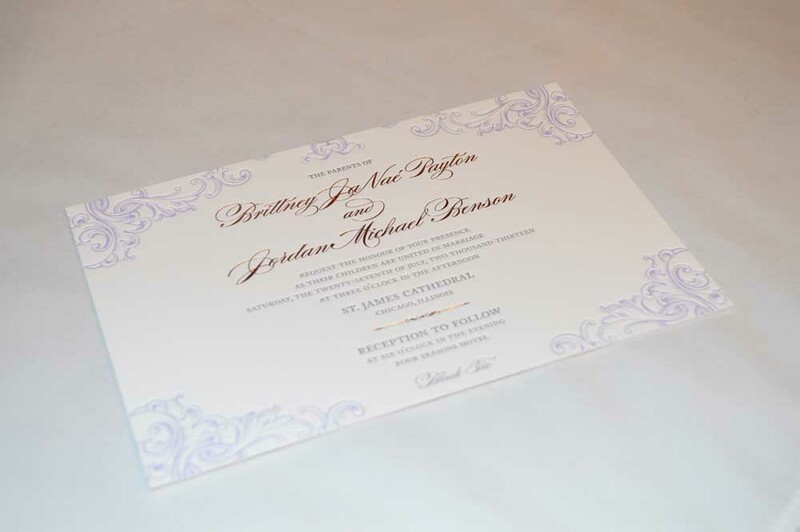 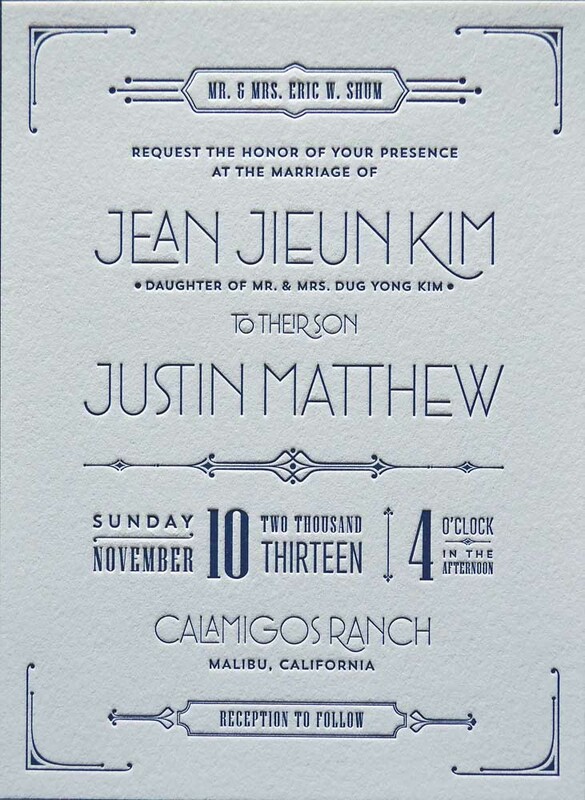 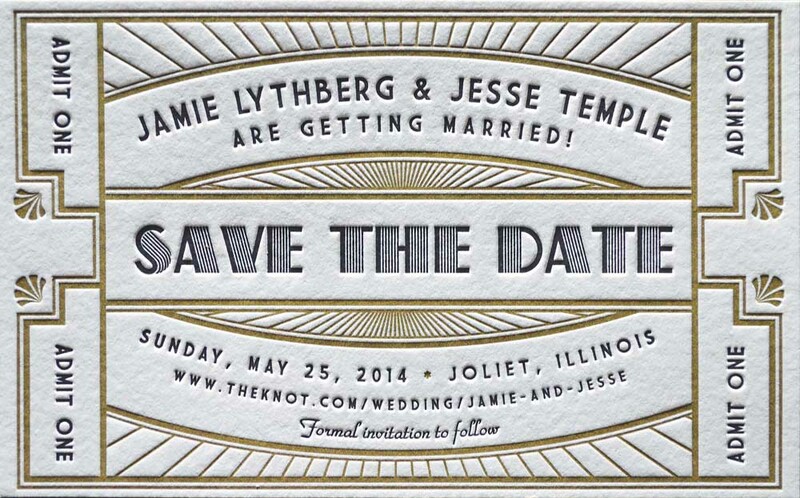 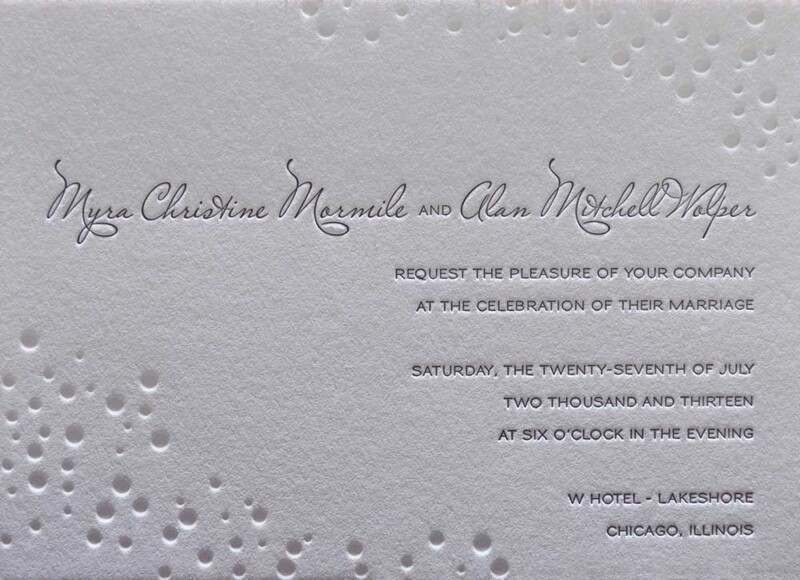 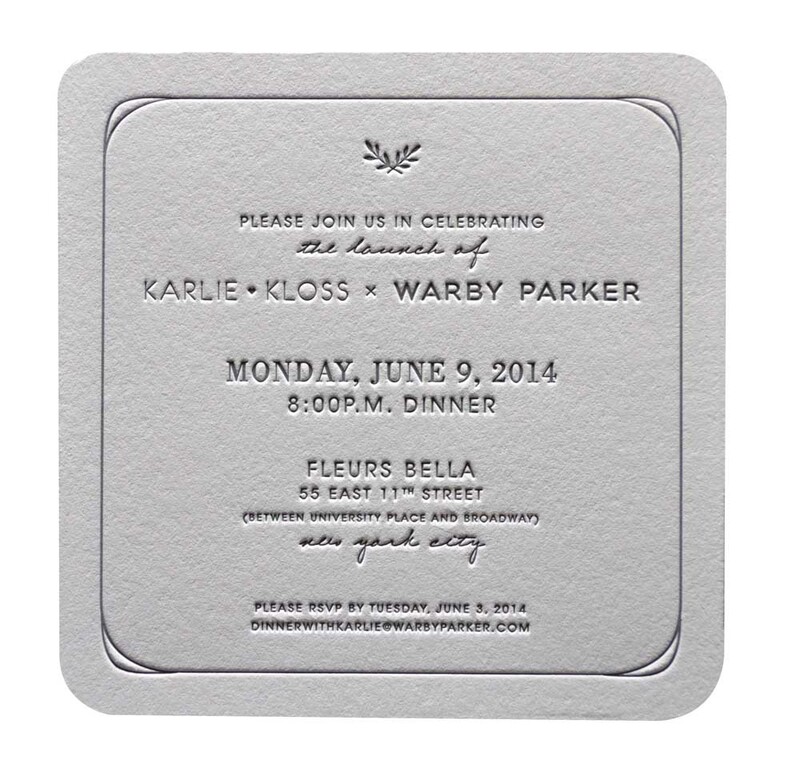 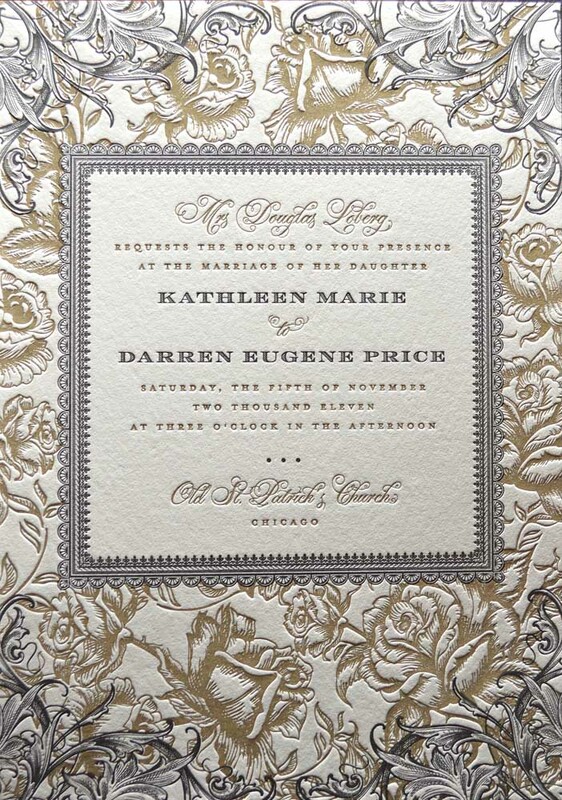 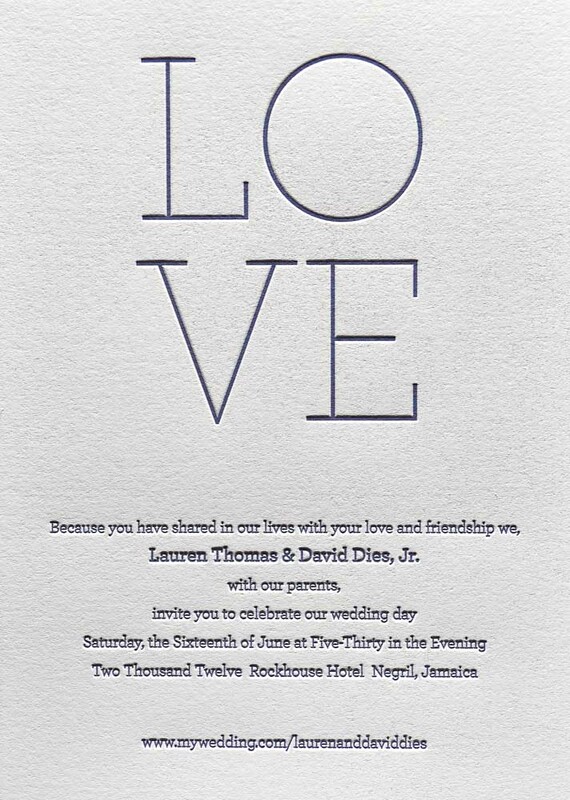 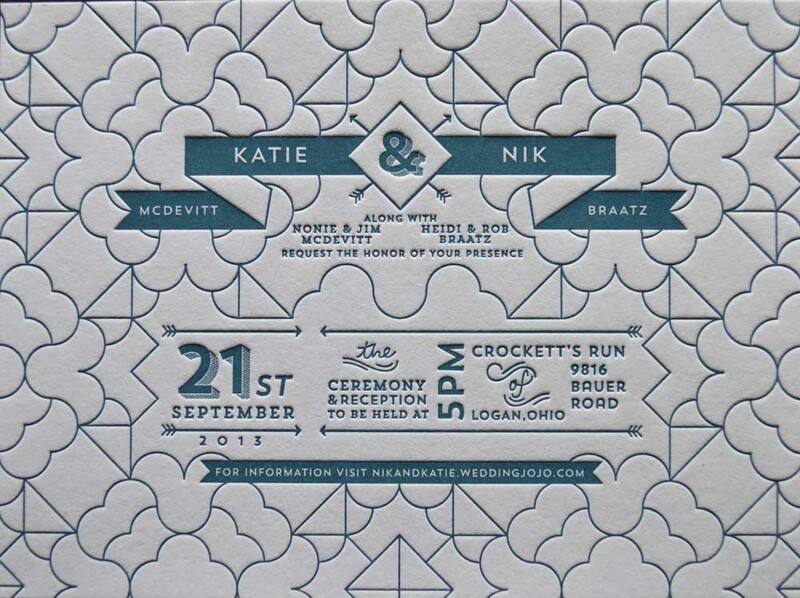 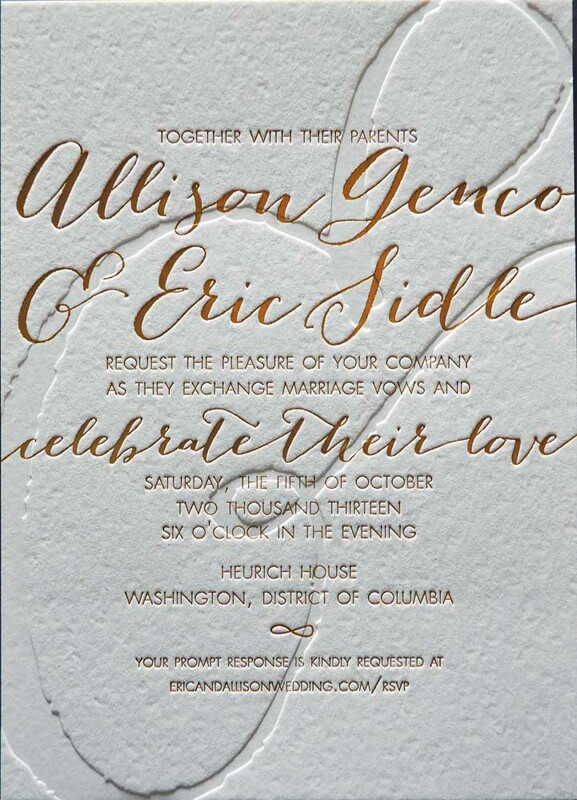 The most frequently produced items are: letterpress wedding invitations, letterpress business cards, letterpress stationery, letterpress invitations and letterpress cards.